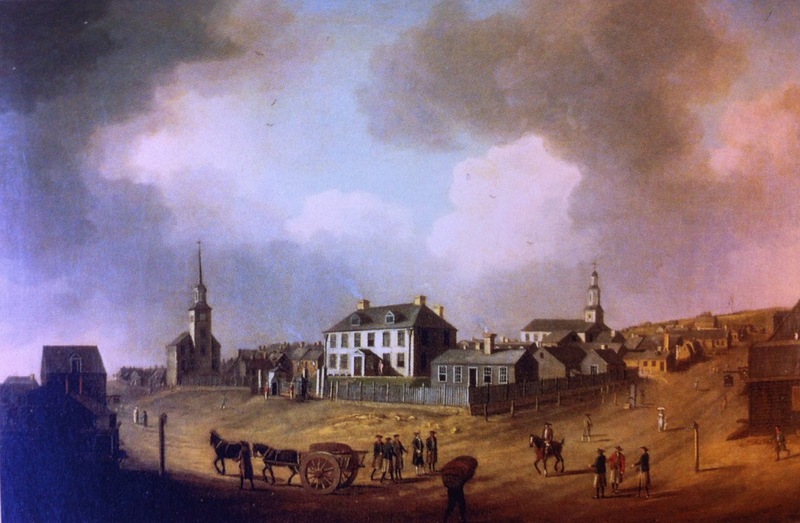 Governor's House and St. Mather's Meeting House on Hollis Street, also looking up George Street, Dominic Serres, 1762, Art Gallery of Nova Scotia via Wikimedia Commons. Though French by birth, Dominic Serres was just as thrilled as anyone else with the British victories in Canada. A key component to these victories was Halifax. Established in 1749 in violation of treaties signed with the local native people, Halifax served as a jumping off point for British operations in Canada throughout the French and Indian War. It would continue to be an important base of naval operations in the American Revolutionary War and War of 1812. The three clustered on the left of this details wear black stockings and petticoat trousers/slops. Their jackets are of uniform length, but one wears red while the other two wear blue. All three of them wear cocked hats: two of them with the point forward, and the man in red with his reversed. The fellow in red also carried a walking stick, and wears a grey or brown waistcoat. 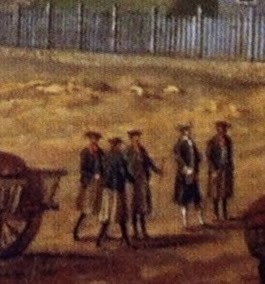 On the far right of this detail is a sailor with slops/petticoat trousers that end right at the knee, a red neckcloth, and blue jacket. The resolution is too low to confidently say anything else about him. By the cart, a small mess of tars are gathered around what appears to be a naval officer. They too wear blue jackets, cocked hats, and slops/petticoat trousers. It appears that all of them wear red neckcloths. At least two of them carry sticks. If any of you are aware of higher resolution versions of this image, I would be very grateful! That would be good to have a higher res pic of that.